Last week, I took my family to the Australian War Memorial. If you've never been (chances are you haven't! ), it's a lavish, cutting-edge facility which aims to both catalogue Australia's military history and teach present (and coming) generations about the deeds of their forebears. It's got all kinds of amazing exhibits, from fully-restored WW2 aircraft to laser and light shows, but for me the most effective means of getting the place's point across are a range of dioramas that are nearly 100 years old. Built during the 1920s, these exquisite recreactions bring the heroism and horror of the First World War to life better than any movie or "interactive experience" has managed in the decades since. I remember seeing them as a small child and being captivated by the craftsmanship. It was like the world's greatest action figure playground come to life. Then, as I got older, their significance changed, each diorama able to capture a moment in time more evocatively than a photo ever could. They don't pull any punches, either. While there are obviously depictions of triumph, such as a cavalry charge at the Battle of Magdhaba or Australia's breaking of the German lines at Mont Saint-Quentin, there are also images of horror, of corpses clogging the mud at the Somme and men frozen in their moment of death during the futile offensive at Gallipoli. The dioramas do exactly what the building itself sets out to achieve, in other words. Captivate and entertain, yes, but also educate and, most importantly, give pause for thought that behind all the plaques and medals and waving flags we like to celebrate are a lot of tragic, needless deaths. 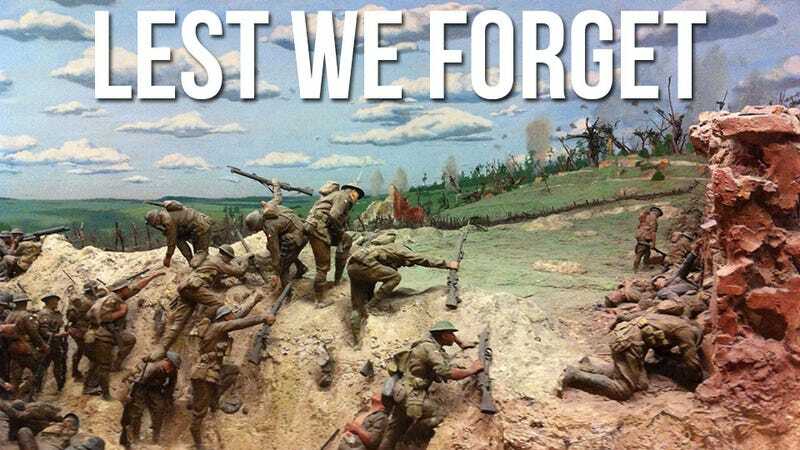 These images capture just about all the dioramas present in the AWM's Great War exhibit. If you're ever in Australia, it should definitely be on your list of places to visit.